Calm Animal Care staff are compassionate, dedicated, and gentle professionals who care about your pet. Dr. 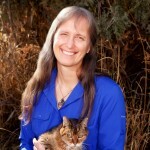 Calm settled in Montana in 1984 after graduating from Colorado State University College of Veterinary Medicine, opening a tiny clinic in the woods up Truman Creek. Calm Animal Care moved to downtown Kila in 1985. As the practice grew so did her family, and both of her sons spent much of their childhood in the clinic. In 1997 Dr. Calm began exploring alternatives to traditional veterinary medicine, earning accreditation in veterinary acupuncture and in veterinary chiropractic. 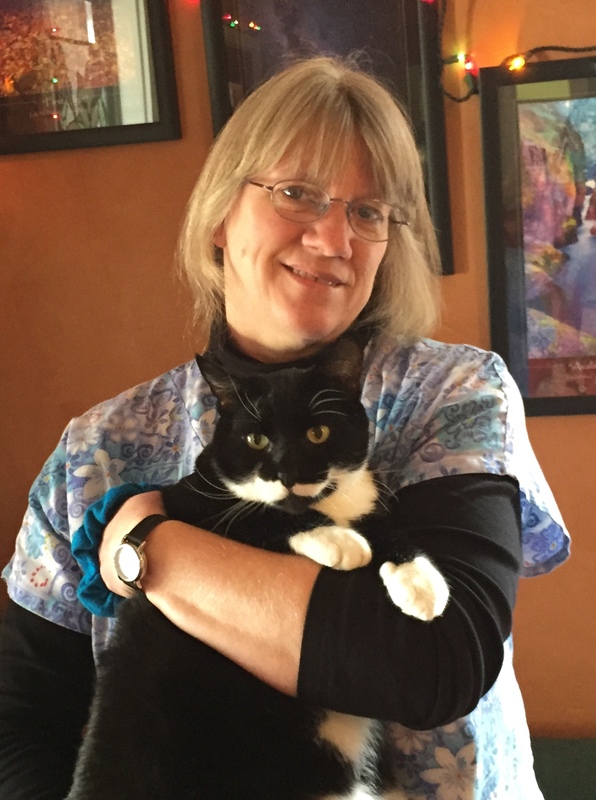 While maintaining her diagnostic and surgical skills, Barbara now focuses mainly on the complementary options for treating your pets, receiving referrals from other veterinarians all over Montana. When not practicing medicine, Barbara’s greatest joy is playing music, and you can follow her bands on our Music and Community page. She’s also a new grandma to the lovely Elinor and visits her often in Portland, Oregon. 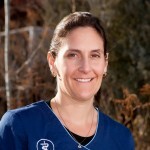 Dr. Hartle grew up in Great Falls, Montana, and received her DVM degree at Washington State University in 1997. 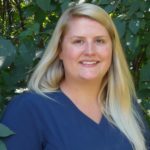 Following graduation she practiced in Great Falls and then in Columbia Falls, finally joining Calm Animal Care in 2004 where her primary veterinary interests are surgery, behavioral medicine, birds, and exotic species. Karen is also a devoted mom, keeping up with the activities of four busy children including a set of twins, and all of their pets including cats, rabbits and a dog. Dr. Meg grew up in Indiana, and launched into a career as a geochemist studying climate change. Her field work was done in Antarctica, where she met her husband and decided she’d like a lifestyle that was a bit more stable. Veterinary medicine was a good fit, and she graduated from Michigan State University in 2009. Meg practiced in Washington State for four years, and made her home in the Flathead valley in 2013. She loves the outdoors, sailing, tinkering in flower gardens, and learning about the world at large. 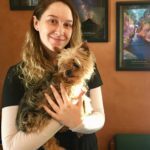 With a special interest in shelter animal medicine, Meg has been the Flathead County Animal Shelter veterinarian since she came to this valley. 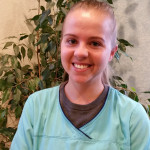 We are so glad that she brought her humor and enthusiasm with her when she joined our practice in July 2015. 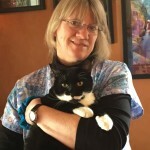 Kari Gabriel joined the Calm Animal Care team in March 2019, after a long career working in public relations, marketing and in higher education. Her love of working with animals began as a little girl who brought home all manner of birds, reptiles and rodents. She began her work as a raptor rehabilitator at the Alaska Raptor Rehabilitation Center in 1991. 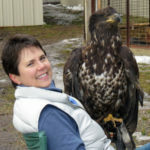 In 2015, with her own federal permits to do raptor education programming, she founded “Montana Bird Lady,” a raptor education and conservation organization using live raptors to provide education to schools and the public. She lives in Kalispell with her husband, Grif, their (not so “mini”) Aussie, Stout; their tortie, LunaTIC; and her raptor teaching team. She is thrilled to be a part of the Calm Animal Care team! 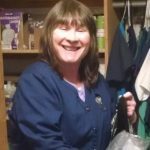 Wendy came to work at Calm Animal Care in 2004, with a keen interest in the details of every aspect of the care that patients receive here, from routine examination visits to complicated surgeries, recovery and followup. She is thorough and skilled and holds herself and everyone she works with to a high standard of care. Wendy’s family includes two sons who have grown up helping at the clinic, a husband who pitches in with mechanical expertise, and a menagerie of dogs, cats, rabbits, chickens and horses. 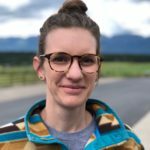 Jess came to Calm Animal Care in Spring 2018 from the Flathead Pet Emergency Clinic, where she grew to be a skilled part of their team and still maintains a connection to help out when needed. Now her schedule allows her to spend more time with her fiancé Mario and their two fur babies Whiskey and Willow. 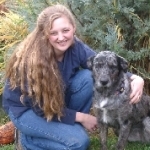 Jess is working her way through San Juan College to become a certified veterinary technician. On days off she enjoys fishing, camping, and hiking with the pups. Christelle came to us in 2016 from South Africa via Australia, having won the heart of her young husband who grew up just down the road. The happy couple then adopted a gorgeous Aussie mix named Halsey, and more recently a Border Collie named Archer. They are the cutest dogs ever! Christelle is full of energy and compassion for people and their pets. She has learned so much since joining us, and has mastered the skills to make her an essential part of our team. In August 2018 she went back to school with the rest of the kids and started her first semester on line with San Juan College, working toward her degree in veterinary technology. Allison joined us in Fall of 2014, taking on the front desk and all that entails. Her calm voice is often the first one you’ll hear when contacting or visiting the clinic. She was born and raised in the Flathead Valley, and her grandparents were homesteaders in Glacier National Park. Allison has four children and an energetic grandson, all herded by heelers, a Corgi and a couple of cats, and describes her home as a “house of fur.” Her creative spark is fueled by making art out of anything from food to yarn to glass. Her nurturing spirit is evidenced by the care that she takes of our staff and clients. She loves working with the Calm Animal Care team and looks forward to coming to work each day! Alyssa moved to Kila from California to join her family, and became a member of our staff in late 2017. Her household includes three cats and four dogs, including a rapidly growing Great Pyrenees puppy! She’s hoping to channel her passion for surfing to a new love of skiing as she makes Montana her home. Alyssa is a quick learner and compassionate and caring animal handler, and we are so glad she is part of our team. She is planning to follow through with her dream of becoming a certified veterinary technician. When Dr Calm first moved to Kila in 1981, the Ercoline family was there to welcome her, and they have been neighbors ever since. Cindy was bringing her dogs and kittens to us when the clinic first opened in 1984, and in 2015 came to work as our cleaning specialist. Last year she moved to daytime work as an administrative assistant, and has been taking on more of the office operations since then. We are so lucky to have her peaceful presence, her industrious nature and optimistic outlook as part of our daily routine, helping everything go more smoothly. Leslie is a Certified Veterinary Technician, having graduated from Bel-Rea institute in 2006. She’s our special Animal Shelter Tech, working with Dr. Meg there since 2013 in all the veterinary work that the shelter does, assisting in anesthesia, surgeries and animal care. Leslie is an advocate for shelter animals and is enthusiastic about giving them a voice, and she also loves to paddleboard and paint. She and her husband Joe live with their pets Lolly the Pug and Fannie the French Bulldog. They are passionate about their youth ministry work in their church.